< Relax – England boss has not quit shock! Tim Southwell is the founder of GolfPunk magazine, which this week saw him honoured as editor of the year in the specialist interest category at the British Society of Magazine Editors awards. Southwell started out as a music journo for NME, Smash Hits, and Record Mirror, before he co-founded Loaded with James Brown in 1994. That went ballistic, and Southwell recounted the tale in his book, Getting Away With It (The Inside Story Of Loaded). Golf trousers: checks or stripes? I like a check myself. Stripes put me in mind of court jesters. What made you want to work in sport? What was your first sports journalism assignment? Interviewing Gary McAllister for 90 Minutes when he was at Leeds Leeds Leeds. Who I support. What is the latest task you have been working on – was it good, bad or indifferent? Writing up a Caribbean travel story for GP. Was a marvelous thing to write except that it kept reminding you that you weren’t actually in Barbados any more. What has been your most memorable/enjoyable assignment during your career? Playing golf with Tiger Woods for the launch issue of Loaded. Before he’d turned pro. Very nice fella. If you did not work on sport, what do you think you might be doing? A fishing mag called PunkFish. Or is that a sport? A little from column A and a little from column B…. naah, until Tiger wins 19 majors, it’s still Jack. He finished runner-up in 18 majors as well, you know. What sports do you play – and to what level? My brother-in-law, Iestyn George, works for GolfPunk and used to be Features Ed at 90 Minutes. What sports event would you most like to attend as a spectator? Jodie Kidd or Elle Macpherson? Elle Macpherson because she got wrapped up in cellophane for a Loaded photo shoot in New York. Which I attended. Lovely girl. Only eats two meals a day, apparently. Bill Williamnson at Midweek for letting me write about anything and always giggling when he read my copy. Alex Kadis at Smash Hits for informing me that all good features have a corking start, superb middle and blockbusting ending. James Brown at Loaded for his punk rock approach to magazines – a cast iron belief that absolutely anything is possible. What’s your favourite sports-related book, and why? 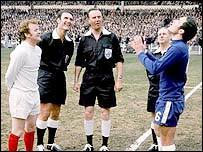 Anything on Billy Bremner (pictured, in white, before the 1970 FA Cup final, which Leeds lost to Chelsea after a replay), Jack Nicklaus or Vincent Tshabalala. All legends in their own right. What changes in the business during your career have you most welcomed? Apple computers. Aren’t they great? And mobile phones. How did we ever get along without them? …and what changes in the business do you really dislike? The stifling advent of … “focus groups”. What other sports magazines do you admire, and why? Gavin Newsham for his fractured take on the game of golf. Iestyn George for his sharp insights into the great game. Martin Samuel at The Times and The Sun. Will Buckley at the Observer is very funny. Write/edit etc about something you’re really passionate about.